Content marketing analytics are critical for success. We know that. Yet, most (75% according to Znet) can’t calculate the ROI of their digital marketing as a whole, let alone their content marketing. Measuring what matters improves decision-making and optimizes market performance. But, what should you measure? Measure what matters. Sounds simple, doesn’t it? But, what matters? In the era of digital marketing, consumers increasingly interact with your online marketing before they convert — stats from Brandpoint show 63% of consumers check out a brand online before buying. How does this interaction contribute to market performance? The answer is different for different businesses because they have different goals. For some clients interested in generating leads, we measure leads and conversion of those leads into business. For other clients, we measure sales or email subscriptions. We call these bottom of the funnel actions because there are usually a number of activities leading to the bottom of the funnel. 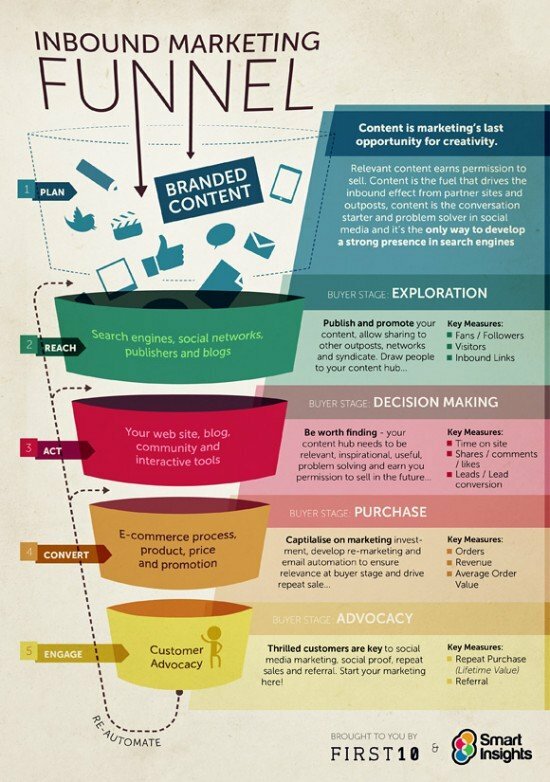 Check out the typical marketing (sales) funnel on the right to see just a few possible actions preceding actual goals. Often we talk about bottom of the funnel metrics as KPIs or Key Performance Indicators. If you’re looking for a list of digital KPIs, check out my list and feel free to add to it. Because we don’t get to the bottom of the funnel where we reach our goals without doing a good job at the top of the funnel, we need to start by measuring top of the funnel activities leading our target market down the funnel. Let’s take a look at content marketing metrics that matter. And, content marketing replaces many earlier forms of marketing communication like TV (folks just skip through commercials), newspapers (folks don’t read newspapers any more), and even recent search strategies (content marketing is the new SEO). 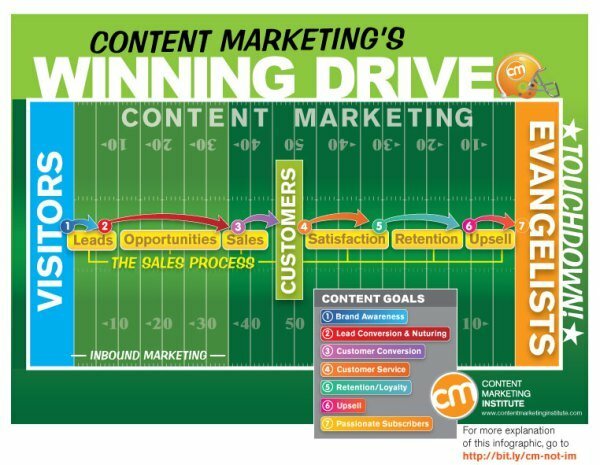 I included the graphic below to show where you might get metrics feeding into your content marketing analytics report. I use a Cognos dashboard from IBM to bring these metrics into a single place to enhance usability. Google Analytics (for blog metrics), Facebook Insights, and Twitter and Pinterest Analytics all have the ability to export data into CSV files that you import into Cognos — or other dashboard software. It’s important to assess both the performance of individual pieces of content as well as the performance of your content marketing strategy as a whole. And, for my money, trends are much more important than point metrics. In addition, you’ll need to add cost and production data — and your content marketing calendar helps with this task if you set it up to capture metrics such as producing content in a timely fashion, time spend on crafting content (which should translate into costs), content backlog (Curate includes a great formula for tracking backlog), and any distribution costs to share the content, such as using Facebook or Twitter sponsored posts or creating PR related to the post. 1. Don’t get fooled with vanity metrics, content marketing analytics go far beyond simply tracking likes and followers. For instance, reach assesses the marketing impact of having a community more effectively than vanity metrics. 2. Attribution is hard. While digital media gives unprecedented access to what consumers think and how they behave, you’ll never really know why they did something. Assuming consumer rationality is a wrong, so you’ll never know what drives a consumer to buy. That means you can’t attribute the sale to the last touch — the last click leading up to a sale — those of you using Google Analytics to create funnels know how different results are between using last touch and attributing sales to the entire pipeline. 3. No one tool gives you all the metrics you need to construct a content marketing analytics report — although MOZ has something they call 1Metric that creates a composite score for individual pieces of content based on traffic, social shares, and link data. 4. You should craft content for each stage in the consumer journey, so some pieces of content aren’t designed to create sales. These pieces of content simply move consumers along their journey. That means you need to evaluate each piece of content against the individual goals for the content, not against the goals for the entire campaign. In crafting your content marketing analytics report, be sure to reflect goal achievement rather than holding each piece of content up to the same standard. 5. Not all consumers are created equal — commerce isn’t a democracy. Some consumers buy lots and some consumers buy a little, so they differ in revenue. Some consumers require a lot of hand-holding and others don’t, so they differ in the costs to serve them. That’s the concept of CLV or customer lifetime value. When constructing your content marketing analytics report, you should include a measure of how effective content is at generating sales from consumers with a high CLV (see here to calculate CLV). Be sure to take a look at the graphic from Curata — it shows various metrics to help construct your content marketing analytics report. I have a few issues with the graphic, such as including vanity metrics rather than reach, but it’s very good overall. Also, check out a recent post where I share an alternative — the 4 factor model for measuring social media metrics.